The Hotch Potch Cooks run a weekly cooking session at South Abingdon Children’s Centre for parents & toddlers. Working together we produce lunch from ingredients provided by the Food Bank, sharing ideas, experimenting and learning new skills. We put together a tasty meal from scratch using limited, ‘left-over’ ingredients. (Ready, Steady Cook meets Masterchef!) The children have become adept at chopping, mixing and grating. Sometimes we have unusual combinations of food but so far we have not been defeated. 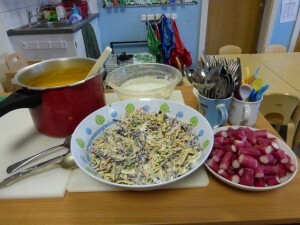 From seven packets of beetroots we produced beetroot, orange and horseradish salad, beetroot and butternut squash soup, chocolate and beetroot cupcakes and beetroot risotto. The homemade lemon curd was a great success and was surprisingly easy to make. Sharing the meal at the end of the session is very important. We discuss ideas on how to make money go further and reduce waste. 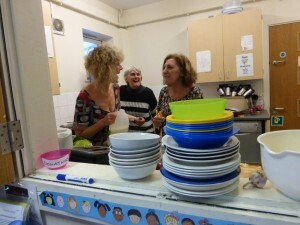 The children are more willing to try new food when they see their friends tucking in. 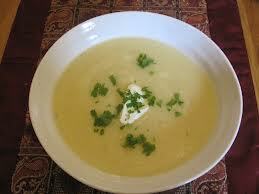 This month’s recipe: Parsnip soup We had this soup @ SACC last week & everyone wanted the recipe so Anthea thought we could have it on the website! Just click on the title to download a printable version.